For maximum odor control and absorbency, choose CareFRESH Ultra bedding. It is made from extra-long, extra-soft bleached fibers, providing a natural, comfortable living environment for your pet. And like all CareFRESH products, CareFRESH Ultra is biodegradable and flushable in small quantities. 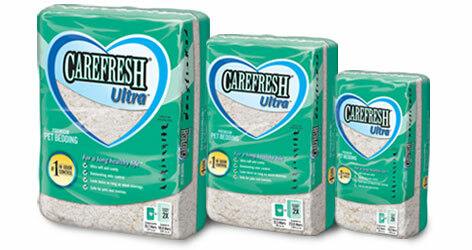 CareFRESH Ultra is a great value, too, since it’s long lasting and requires fewer changes. Its patented formula is free from dust and contaminants like pine or cedar oils, so it is safe for your small pet.